I came home this afternoon from a wonderful Rigoletto in the Opera Bastille last night, in time to splash some autumn impressions on paper. 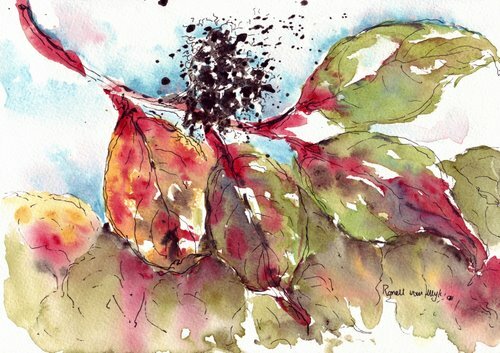 I just painted some colours onto paper as I saw the colours of the leaves and rose hips and and afterwards added some suggestive linework with 2.5 rotring pen. I think I’ll explore more autumn colours in the days to come, before winter takes over. All done on Fabriano CP block, 18x25cm. Watercolour and pen. Simply splendid, Ronell – especially those rose hips! Wonderful colors – just perfect for autumn! Beauteous!! It is so ‘autumn’ Ronell! Ahh! My favourite season, in the regions of distinct seasons. My “pick” is the hips. Just back from a NZ spring, I will have to splash my paint from photos and memories! You are giving all of us a wonderful autumn day, Ronell. for taking us along on your walks. Gorgeous autumn colours – love that deep red! You almost make me wish autumn was coming round here again, but we’re enjoying a lovely long mild spring – sometimes it only lasts a week before summer strikes with a vengeance! these are beautiful, love the vibrancy of your colors!! Ronell, you have definitely captured the colors and energy of autumn! I love the deep reds in the first painting and just everything about the rose hips. Your paintings always look like you had so much fun creating them. It makes them fun to view too. Lovely representation of Autumn in your lovely watery intrepretation which I Adore! Really beautiful colors here. Spot on. Luscious, Ronell! I particularly love the orange berries with the touch of blue. stunning, stunning, stunning work Ronnell. Well, Rigoletto obviously served you well and got your creativity bubbling! These are beautiful! Thanks for the birthday wishes, Ronell! I appreciate it. Your fall colors are lovely! I LOVE these!!! 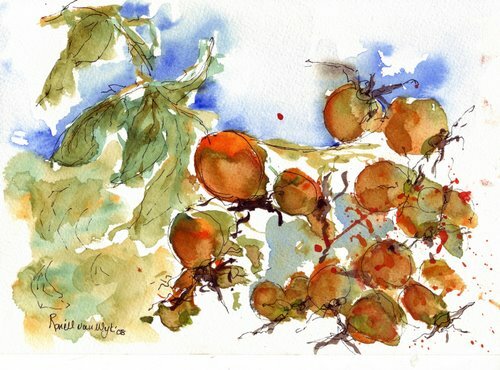 Ronell in top watercolor form on a beautiful autumn day—what could be better? Gosh, I can’t tear myself away! YEEEEEAAAAAh! You’re BACK…. with a passion!!!! LOVE , love love each one of these… but especially the last two! Ohhh I really MUST learn to use more water! Your paintings are soooo lush! 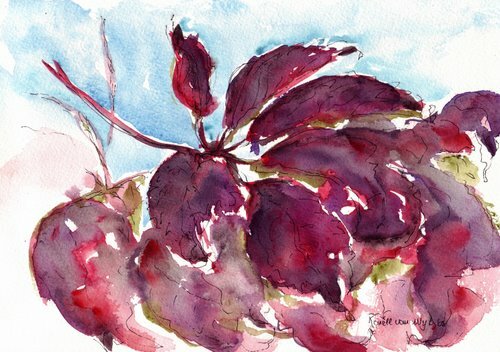 I love it when you start splashing colour around, Ronell that first picture particularly, swept me up in the joy of Autumn. I noticed the first change of colour here yesterday and the leaves of the lime trees are falling like confetti along the road. Next thing, I’ll be craving hot chocolate. Love this…your colors, the loose style allowing the paint to mix on the paper. Just beautiful. Thanks for letting us see. Awesome! I love the way you played with colors first and then added some lines. Wonderful. Thank you to everybody for stopping by and taking time to leave a comment, I appreciate your visiting! Wow, Ronell. These are so beautiful. Wonderful autumn colors. You have such a wonderful style!! !